Given that I am just over 5’1, I will always gravitate towards the highest heel I can find. The smallest heel in my closet is 4 inches…..until I moved to Sydney. 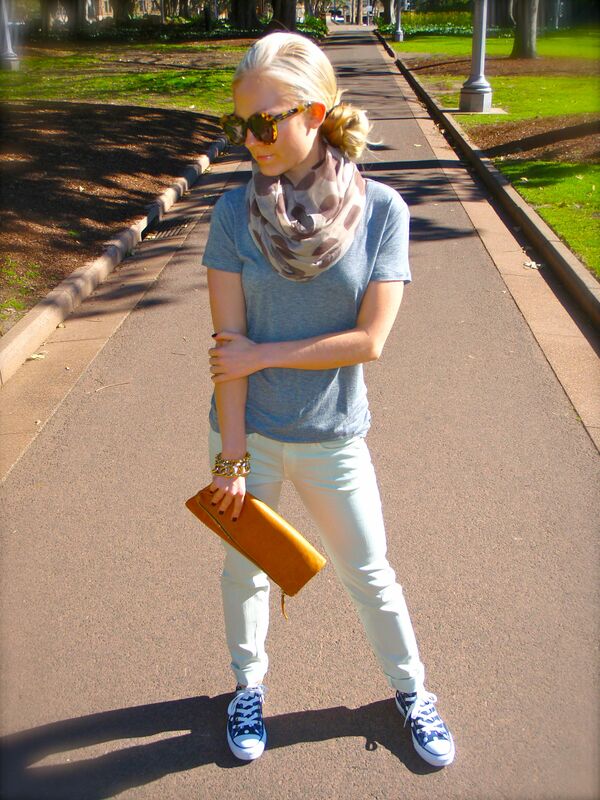 Just like NYC, DC and any other large city, Sydney is best explored on foot….and those feet must be stylish. I hesitantly set out on my first “flats” shopping trip and was pleasantly surprised by the abundance of amazing options. 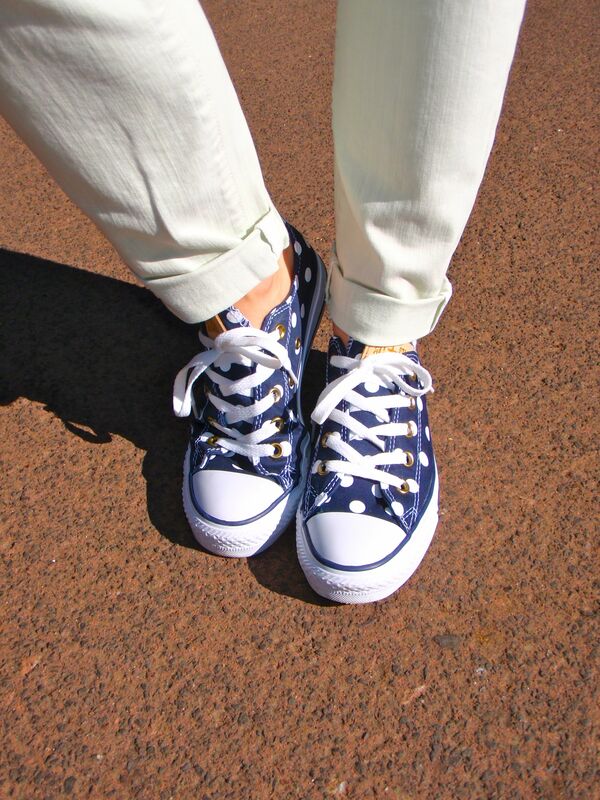 I just couldn’t resist these speckled Chuck Taylors. I discovered these fabulous clutches several years ago through a friend of mine. I love the simplicity combined with the luxurious leathers and suedes. Ms. Vivier started this line as a solution to a stylish laptop case and soon parlayed it into a fabulously successful handbag line. Her chic simplicity is reflected in every piece which gives all women a bit of Parisian flare. 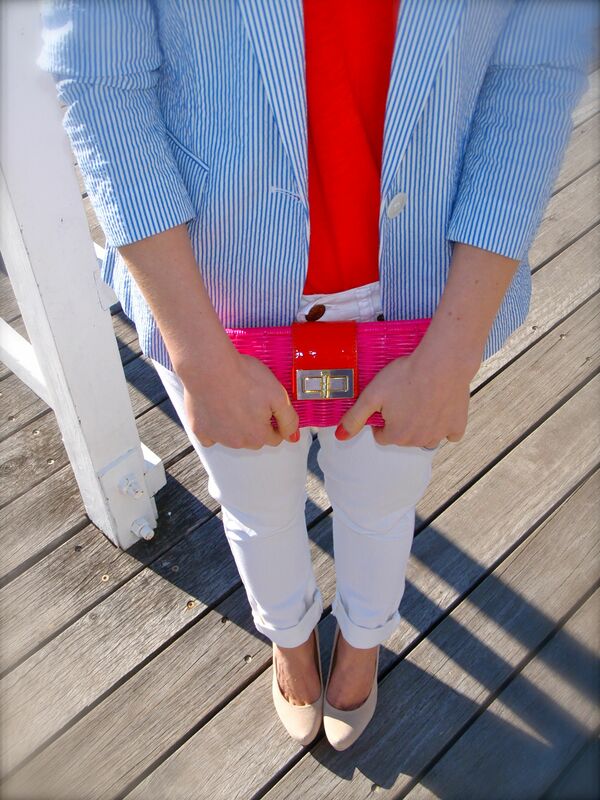 My pick is this tan with pink stripe flat clutch. The pop of pink is just enough to take a simple accessory up a couple of notches. The flat clutch is the smaller sibling to the fold-over and is just as amazing. 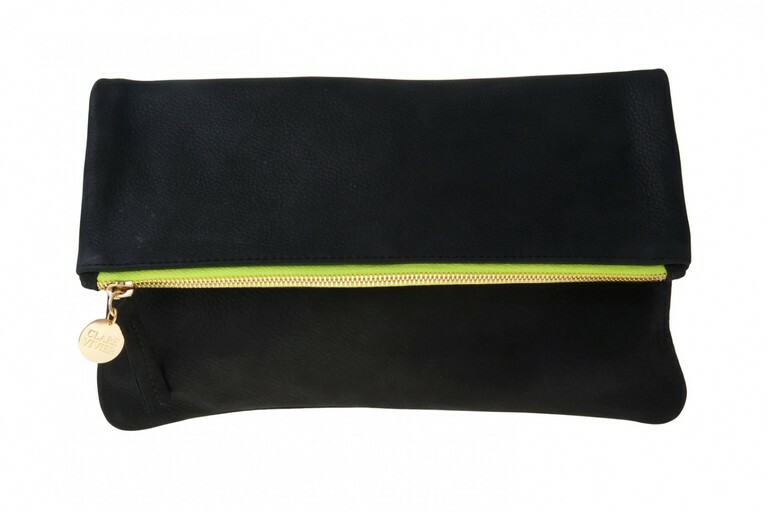 Carried by Katie Holmes, this stylish pouch is the perfect clutch size. (I recommend this). Pick your texture: I gravitate towards the pebbled leather. It is the heaviest of the leathers and handles wear and tear effortlessly. The smooth leathers are a bit thinner but butter soft. 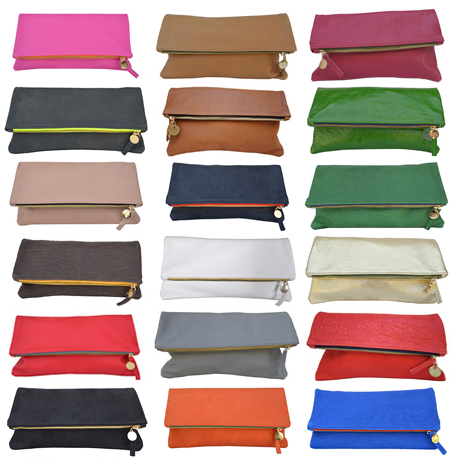 Pick your color: It’s hard to pick just one from Clare Vivier’s collections. Good luck! Clare Viver newbies, I recommend starting with a basic like the black pebbled leather or a cognac. 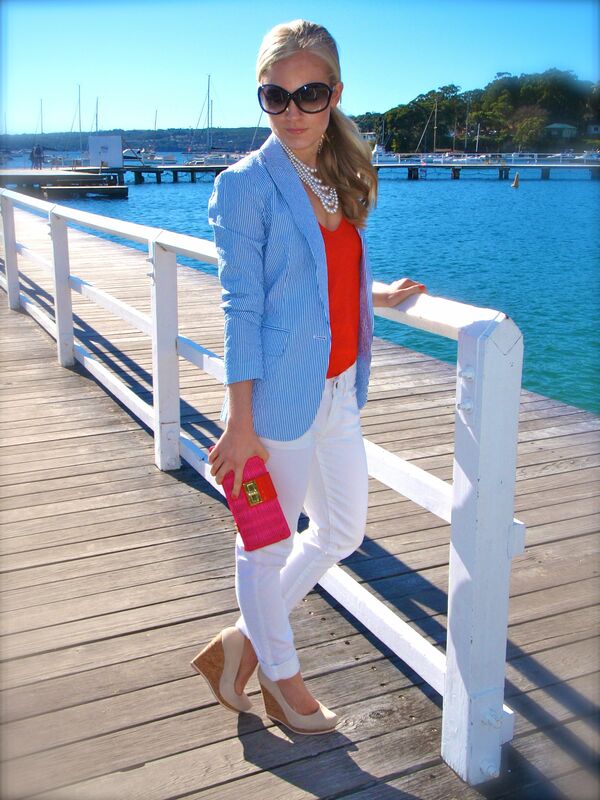 I am currently obsessed with the neon zip that has added a twist to this basic black clutch. 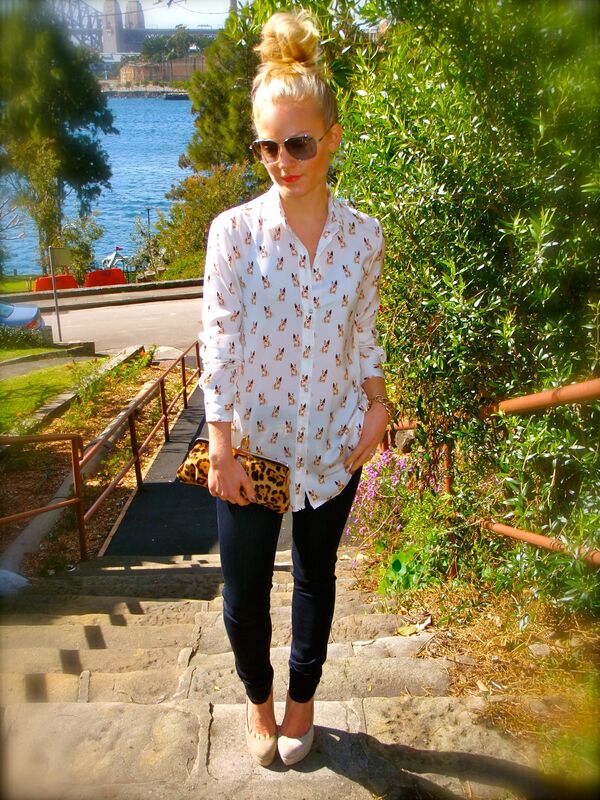 A good leopard print is also top on the priority list. 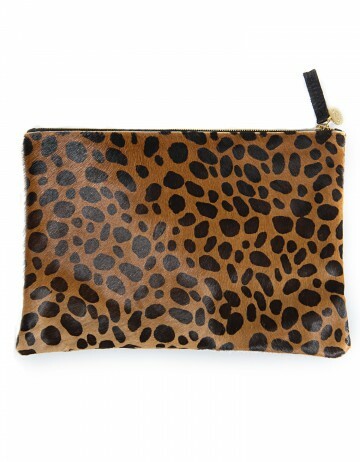 Clare Vivier’s leopard clutch is stunning and done in a beautiful pony hair. This weekend was simply amazing weather wise, so of course we headed towards the coast for some sunshine, stunning views and yummy eats. Hugo’s Manly is the beach-side location of this fantastic eatery which is known for its pizzas. (I am obsessed with the mushroom pizza ~wild mushrooms, taleggio, goat’s curd & caramelized onions~) I like this recipe. My go to outfit is always an amazing pair of jeans and a comfortable, chic top and of course a pair of statement flats or heels. 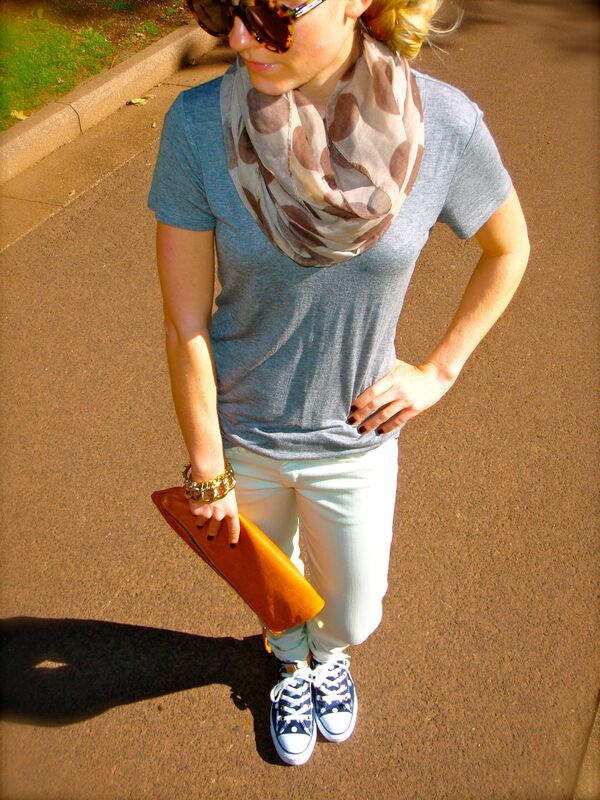 Casual chic is always what I will opt for when heading out with friends or out and about on my weekends. This past week, I found immense enjoyment in playing a bit of dress up for a rather formal affair. With high tea in order, I decided to channel a bit of a garden party vibe with my wonderfully colorful dress. The chain detailing and black accessories gives this otherwise sweet look a bit of an edge, which I love. 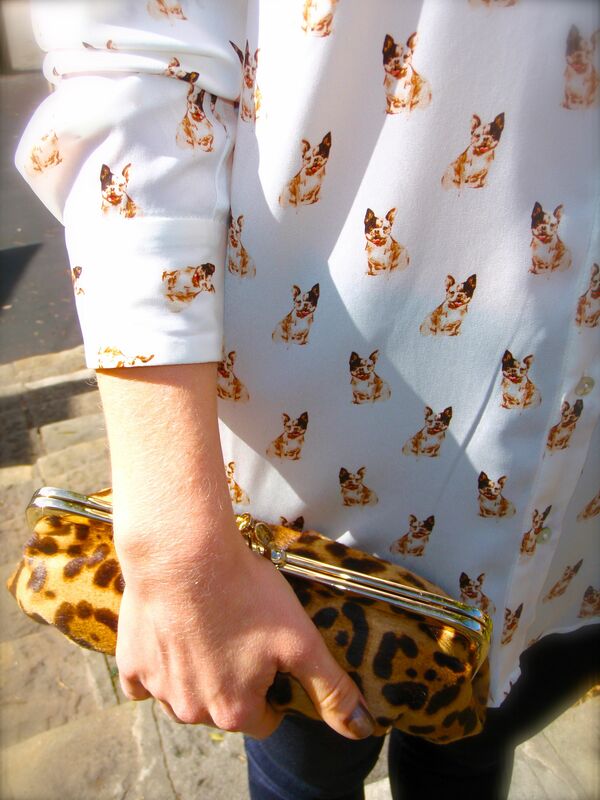 I absolutely could not resist the sweet little “Frenchies” scattered across this shirt. 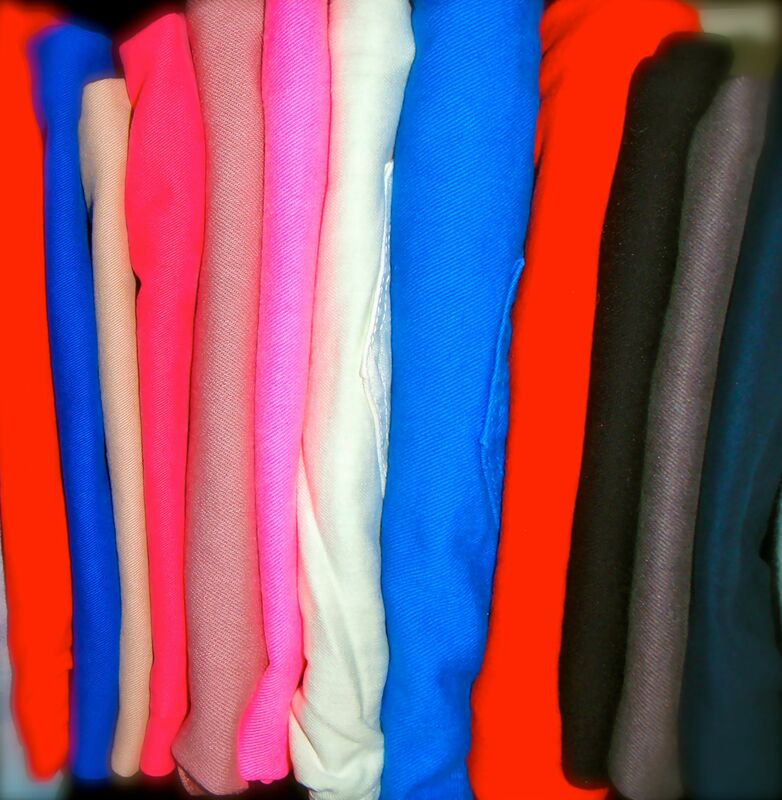 Animals, lips and chic french phrases all adorn soft tees and cozy sweaters this season…and I have to say I love it! 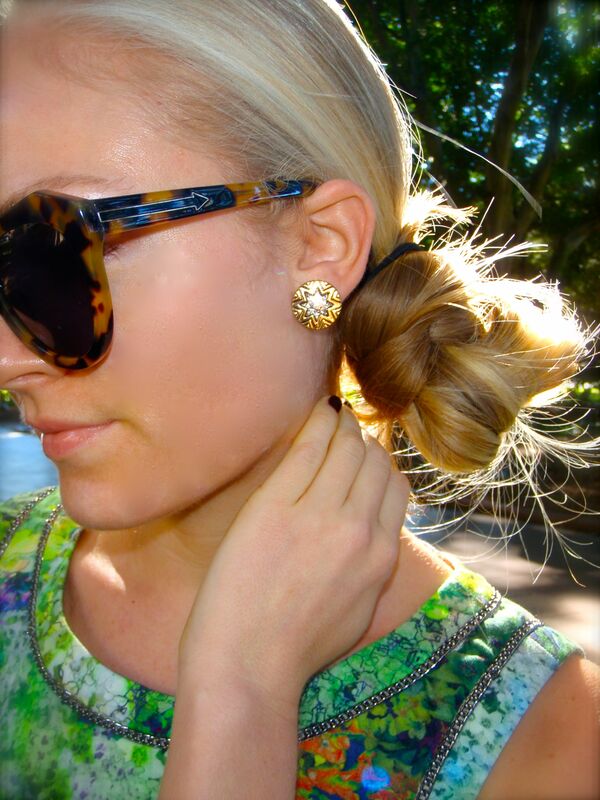 Its the perfect twist on an otherwise basic. I decided to go casual with solid jeans and shirttail out, but take the puppies to work with a pencil skirt, heels and blazer. J brand by far outweighs any other brand in my closet. I keep going back to these fabulous jeans for many reasons: Each season they seem to reinvent the basic jean to fit better, feel softer and produce a fresh take on the seasons already hot trend. I like the fact that J brand offers many different fits and really understands every girl is a different shape and size. J brand 811 – You will know this style from the gigantic array of candy colors it comes in. Also known as the 811 twill, this jean is more like a pant. The twill gives them a soft cotton feel with a bit of J brand classic stretch. The inseam in these for me is a bit long at 30 inches. (Ankle fit will fall at 29 inches) I love to roll these for a more casual look. When trying these on, they should feel tight as they will as well stretch at least half a size larger. (I love these, these & these). J brand 901 legging – The J brand 901 & 915 are a girls best friend because of the slimming fit. They have a substantial amount of stretch which makes them feel like you’re not wearing jeans. Starless is one of my favorite washes and are my staple due to the dark wash. Size down one size with the level of stretch. J brand 620 super skinny – My newest jean addition is part of this family and I’m in love! I chose cafe and lavish. As noted the fit is super skinny but extremely comfortable. Note that the styles with tencel in them will stretch closer to a full size. I ordered my usual 25 but could do a 24 as well. The stretch factor in these jeans is amazing. They are by far the most comfortable. (I’m obsessed with these & these). It really is hard to pick just one pair of J brands. Their leather pants are some of the best I own and the array of colors, metallics, crops, widelegs hit the mark every time. Fit and quality is always exceeded with this brand. Visit any Southern’s home you are likely to find sweet tea, a “Welcome y’all” sign and seersucker, in various colors. Shorts, dresses and men’s suits with matching bow ties all roam freely in the South in this fabric and I have to smile every time I’m home. Southern summers are always spent beach-side, perched on a crisp white Adirondack chair, wide brim sun hat, taking in the salty air. Seersucker always seems to evoke these memories for me.